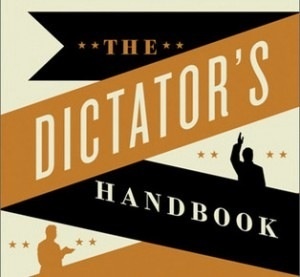 This is a somewhat amusing book looking at the differences (or better yet, similarities) between dictatorships and democracies. Basically, according to the authors, potential political leaders need to worry most about one thing: you can not be a monolithic leader; you will have to keep a certain group of people happy in order to stay in power. How large that essential group, or coalition is, depends on what kind of government you want to form– democracy (large coalition) or dictatorship (small coalition). In a dictatorship the coalition is small. It is imperative for the dictator to maintain strict control over the bank accounts so that he, and he alone, will be able to pay off the necessary people who can keep him in power, or take him out (like a military commander for example). In a democracy the essential group of backers will be much larger, so the option of simply paying them off is much too expensive. Here the leader buys loyalty through programs and policies. The book uses several real world examples to back the points made. For example, Samuel Doe of Liberia, who, although being an unskilled soldier, managed to assassinate the president and take control of the country. Sounds a lot like how the Khmer Rouge came to power in Cambodia in the ’70s. Samuel Doe did not fair well though. He too was taken out of power, tortured (to reveal where all the money was), then cut up, cooked, and eaten. Mmm mm. Overall I thought it was a decent book. However, I did find it to be over-simplified and too repetitive. I think, with it being nearly three hundred pages long, it could easily be a hundred pages shorter and thus a lot less monotonous.